As a strict follower of the Keto diet, continuing to drink coffee can present a challenge because of the sugar (carbohydrates) that are in milk and cream. And so in this post I review 13 alternative sugar free coffee creamers that are delicious, nutrient rich and will allow you to continue to drink coffee as part of your Keto diet. For those of you who are in a rush, find my top picks below. Firstly, I want to have a look in more detail at traditional coffee creamers and why they aren’t Keto friendly. Coffee creamer is a liquid or powdered (granular) non- dairy product that is added to coffee instead of milk, cream or half and half. The biggest advantage of coffee creamer is that it is dairy free. It can be used by people who are lactose intolerant, to flavor or whiten their coffee. You mean that we are being lied to?! Many dairy creamers contain sodium caseinate, which is a milk protein. Which means that any coffee creamer that contains this ingredient is not dairy free. The dairy free label applies because the serving sizes of coffee creamers are so small that the amount of milk protein found in the serving is so small, that it is not worth mentioning. The second reason that people drink coffee creamers is that enables them to add different flavors and tastes to their coffee. It allows for much more variety than just milk or half and half. Only 28% of Americans drink their coffee black, which leaves a staggering 72% of drinkers that add something to their coffee, whether it be milk, half and half or a coffee creamer. And 40% of these drinkers indicate that buying a creamer with added flavor (such as vanilla) is an important factor in their choice. And the final reason for people to drink coffee creamers, is that certain types of coffee creamers (such as granular or powdered varieties) do not need to be refrigerated. And this makes them so much more convenient to use than their dairy counterparts. Although traditional coffee creamers are dairy free, that doesn’t mean that ever other ingredient in them are nutritional. Many of the biggest selling coffee creamers still have a range of other ingredients that are at the very least should be considered unhealthy and at the most, should be considered harmful. The concerns about these ingredients extend beyond the low carb diet community to everyone who is consuming these products on a regular basis. The list below includes the ingredients we should be most concerned about. This is a polysaccharide that is extracted from red seaweed. It is commonly used in the food industry particularly in dairy products because of its thickening and stabilising properties. It is used in coffee creamers because it adds a creamy texture to a product and it helps the product maintain its creamy texture. Although some studies have found carrageenan to be perfectly safe in laboratory tests, some people have raised concerns about how it can lead to inflammation or bloating. So, this is a very contentious ingredient indeed. Essentially, this means that by using monoglycerides and diglycerides, a product will not separate and curdle. This is a food syrup which is made from the starch of corn. It has long been blamed for being a root cause of the American obesity crisis. It is added to foods to soften texture, add volume and to enhance the flavor. A bottle of standard “vegetable oil” will probably be soybean oil. It is extracted from the soybean Glycine max. Americans consume a staggering 20 billion pounds every year. And this is the main problem with soybean oil- it is ubiquitous. It is in so many processed foods that our bodies are awash with it. It is used in various foods such as mayonnaise and coffee creamers because it prevents liquids from separating. Soybean oil is a trans fat and as such is known to cause anything from heart disease to cancer. This beautiful sounding chemical is typically added into (liquid) non dairy creamers to prevent coagulation. Stopping the liquid from turning into a solid. One of its key benefits is that it is a convenient source of potassium. A potentially harmful side effect is that its phosphorus content is too easily absorbed into our bodies. And so people who eat foods that contain it for prolonged periods might suffer from a variety of side effects. Ranging from headaches to diarrhea. Sodium caseinate is a protein found in all mammal milk. It is thought to account for about 3% of cow’s milk. It is added into food to provide flavor and consistency. It is thought that after lactose intolerance, casein is the second biggest reason for allergic reactions to cow’s milk. Leaving you with that uncomfortable thought, it is time to shift our focus and look at sugar free syrups. Grass Fed Ghee Ghee is clarified butter. It differs from butter because whereas butter contains butterfat, milk solids and water, ghee is pure butterfat. Ghee is high in calories but it is thought by many to be healthier than butter. MCT (Medium Chain Triglyceride) Oils are found in abundance in coconut oil. They are a true super ingredient which can help weight loss and are a great source of energy among many other benefits. Collagen is a protein that helps the skin, bones and muscles. In 2015, up to 44% of US households consumed coffee creamer. And 37 billion creamer cups are consumed annually. The best news is that the choice of sugar free coffee creamers is growing on a month by month basis. This is partly because the coffee creamer market as a whole is huge and is set to grow even more. But it is also because so many people want to buy sugar free coffee creamers. In this recent report , 24% of coffee creamer consumers indicated that “no added sugars” was a deciding factor when they were buying a coffee creamer. There are other “friendly” types of coffee creamers out there. We know that people want to know what the Keto Diet is but they do not want to go into all of the long winded and extreme explanations about the science of it and the human body. So, with that in mind, we have tried to give you a brief rundown of exactly what the Keto diet is. In simple terms, the Keto Diet will restrict the amount of carbohydrates a person can consume, which will in turn allow the liver to start producing a different fuel source known as ketones. By restricting the amount of carbs we can consume, we will more than likely also consume less calories, due to the healthier foods we are now eating, which will then lead to a reduced feeling in hunger throughout the day. The Keto Diet has been found to help people in many different ways and, as well as being a great way to lose weight, it has also been found to improve a variety of different blood markers. As well as that, the Keto Diet will also reduce the risk of such diseases as Alzheimer’s, Type 2 diabetes, and some forms of cancer. The key to being successful with the Keto Diet is to try to make sure you are eating a balanced meal which consists of around 70% of Fats, 25% of Protein, and just 5% of Carbs. Stick as close to these as you can and you will definitely be on course to enjoy a successful experience on the Keto Diet. Can I drink coffee on the Keto diet? The simple and easy answer is yes! As long as you are happy to stay away from milk and cream and traditional coffee creamers as they all contain sugar and lots of dairy. The good news is that this opens up a whole new world of healthy and nutritious creamers that will help you in your Keto diet as well as having numerous other benefits. Bulletproof Coffee is a very popular coffee choice for many people who are on the Keto Diet. Bulletproof Coffee consists of brewed coffee, with a touch of grass-fed unsalted butter, along with some medium-chain triglyceride (MCT), and finally some coconut oil. At some point, it might be worth making one for yourself. The Atkins diet is diet that restricts the amount of carbohydrate that are consumed whilst consuming as much protein and fat as you like. The reason why this approach is so effective with weight loss is that by eating more protein and less carbohydrates will lead to a reduced appetite. Which means that you consume fewer calories. Created by a Robert Atkins, the diet was created after he himself needed to lose weight. After lots of research, Atkins created a set of principles around a low carbohydrate diet. The diet contains four phases. You move between the different phases depending on how close you are to your target weight. Phase 1 (induction) In this phase, less than 20 grams of carbohydrate are consumed everyday together with lots of fat and high protein foods. Phase 2 (balancing) This phase sees a gentle increase of carbohydrate back into the diet, including small amounts of fruit. Phase 3 (fine tuning) As you near your target weight, you can add more carbs into your diet in order to slow weight loss down. Phase 4 (maintenance) In this phase you can eat as many good carbs as you can without gaining weight. In 1972, Atkins published a book “The Atkins Diet” which explained these principles in detail. And in 1989 Atkins Nutritionals was created- a company that promotes sales of Atkins branded products. Can I Drink Coffee on the Atkins Diet? There is nothing wrong with drinking coffee whilst following the Atkins diet. As long as you drink it in moderation. This is particularly important in phase 1 (induction) because excessive amounts of caffeine can cause low levels of blood sugar which might lead to sugar cravings. What’s the Difference between the Keto Diet and the Atkins Diet? The key difference that you will want to focus on between the Keto Diet and the Atkins Diet, is the fact that your protein intake varies between the two of them. …but when it comes to the Keto Diet you are limited to 20% of your daily calories being protein. As well as that, the Keto Diet also focuses quite a lot on restricting your carb intake and making sure your body being in ketosis while you are on this diet. Meanwhile on the Atkins Diet you are only required to do this early on, before then slowly reintroducing carbs back into your diet. With that in mind, the Atkins Diet is probably more sustainable for the long term, due to not being too restrictive but it really is down to the individual to decide which one works best for them. Can I Drink Half and Half In My Coffee Instead? There is some confusion that surrounds the Atkins Diet and adding half and half in coffee. The bottom line is that if you only use a spoonful of it in your coffee, don’t worry about it. That serving will only contain less than 1 gram of carbohydrate. And it is because of misleading labels on the containers. If you were to read the labels of many half and half containers, you might believe that it contains no carbs. This is because half and half is normally only used in very small servings and so because of that on some labels carb content might not be listed. And so, the more you use half and half, the larger your intake of carbs is. If you want to add a dairy product to your coffee and your only concern is the carbohydrate content, then a better choice would be heavy cream. Heavy cream contains far fewer carbohydrates than half and half because much more of it is fat. A cup of half and half contains 10g of carbs, whereas a cup of heavy cream only contains 7g of carbs. But, bear in mind that one cup of heavy cream will also contain over 800 calories. One of the best ways of making sure that the coffee creamer that you use is exactly to your liking, is to make it yourself. That way, you will know for sure that creamer you use is sugar free and tastes delicious. A quick look online will show you a huge range of recipes to follow. Most of the recipes are very easy to follow and use ingredients that are very easy to get hold of. The only choice you have to make is whether to follow a highly sophisticated recipe that uses lots of ingredients or a simpler recipe that only uses a few. Either way, with a bit of planning and effort you will be able to make your own sugar free coffee creamer to use on Atkins. Indulgent, delicious cocoa goodness added to your morning coffee. Sounds amazing, right? 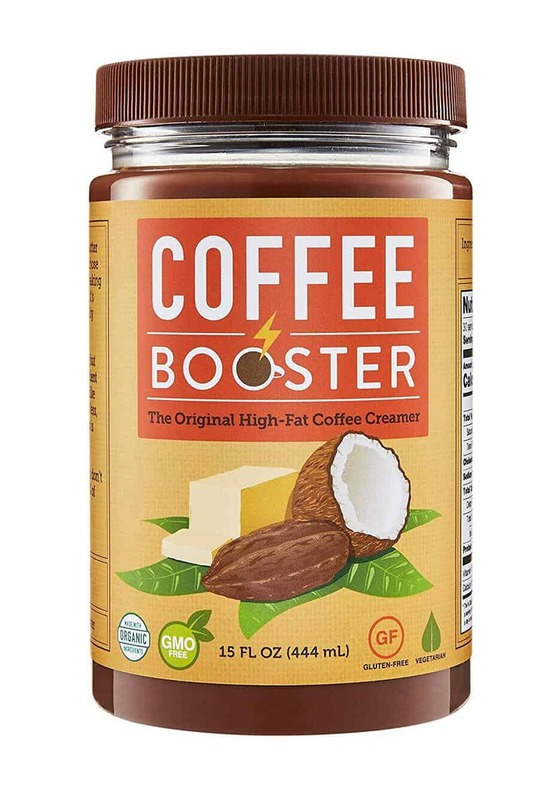 Coffee Booster is made of 100% GMO-free products – cold-pressed coconut oil, grass-fed ghee and raw cocoa to add something truly special to your keto coffee break. What makes it extra special, is that it doesn’t have any weird tasting emulsifiers added, so you taste exactly what you’d expect. There are even four different flavors to try: cinnamon, naked, original and vanilla. Brim-full of healthy fats and some carbs (sorry guys, all this deliciousness will add a tiny bit to your carb count), you get about a whole meal’s worth of energy from one scoop. This will keep you going for a long time, boosting brain and body for added productivity in your day. Coffee Booster is easy to mix into your beverage. For added yumminess, you can always use one of those nifty little mug frothers. Makes it extra foamy, ya know? As long as you don’t leave it in direct sunlight, your coffee booster will be fine on the shelf and doesn’t need to be refrigerated. Looking for an organic, delicious, keto-friendly coffee creamer? Coffee Booster is your new best friend. An easy solution to keto-friendly butter coffee, the Omega PowerCreamer has everything you’d expect: organic ghee, coconut oil, MCT Oil and Sunflower Lecithin (non-GMO, of course). It also doesn’t have any of the bad stuff, like sugar, lactose, casein, carbs, gluten or sweeteners. Rad! And, it comes all in one bottle. You don’t have to lug around a gazillion separate ingredients to make your keto coffee. You don’t have to refrigerate you Omega PowerCreamer. It’s liquid, but it won’t go sour on you. Simply blend it into your favorite beverage using an actual blender or a milk frother. It’s a great meal replacement or supplement, especially if you have an active or crazy busy lifestyle. You can even use the Omega PowerCreamer as a breakfast replacement when fasting. Now that’s cool. Looking for a healthy ghee-based, gluten-free keto coffee creamer? We think Omega PowerCreamer is the perfect fit. This unsweetened creamer has been created for people who need sugar free coffee creamers and who don’t want to compromise on taste. It is made by blending coconut milk powder with coconut oil and palm oil. And a weird sounding aquamina- which is a sea algae that contains important minerals such as calcium. Add a couple of teaspoons to your coffee and as you stir it in, what the froth! Finally this product is gluten free, dairy free and only uses non GMO products. Are you constantly on the go and finding it hard to maintain your keto diet? The Perfect Keto MCT Oil powder is perfect for you. Packed with all the goodness of MCT oil straight from coconut, it has none of the sugary nasties of the usual alternatives. There’s also no fillers, fibers, carbs or corn starch in this saintly supplement. You can stick it in a baggie in your glove compartment, pack it in your suitcase for a business trip or even chuck it in your gym bag. It’s the ideal keto supplement and it won’t leave a mess all over your car if you accidentally forget it in there on a hot day. Adding it to your ketoproof coffee or smoothies will add an amazing creamy taste and some awesome fats, just the way you like it. Worried about GMO’s, heavy metals and other impurities or nasty BPA-filled packaging? Don’t stress! Every batch of Perfect Keto MCT Oil Powder is lab-tested to ensure that you don’t get any of that. The packaging is also a BPA-free, food-grade PET container. These guys have your back, every day. If you’re a keto fan and constantly on the go, the Perfect Keto MCT Oil Powder is the product for you. Keto Coffee Creamer is MCT oil and coconut oil based, perfect for your keto butter coffee. You’ll find this one on the pantry shelf, not in the fridge. If you store your Keto Coffee Creamer in the fridge, it will go rock hard and you’ll have a really tough time getting any use out of it. You’ll also have to use a countertop blender to fix up your morning brew, since the oils will separate if you don’t. Speaking of separation, you have to shake it like a polaroid picture …. Heeeeey ya! before each use, or you’ll only get half the goodies in your scoop. Not your cup of tea? Try a smaller serving if you’re new to keto coffee, since it could upset your stomach if you’re not used to it. The Keto Coffee Creamer is chock full of MCT Oil, farm fresh ghee and organic coconut oil, helping you maintain energy throughout the day and dealing with those nasty food cravings. No carbs and gluten free. How keto friendly is that? Since there’s so much ghee in it, it does contain dairy, although it is lactose friendly. 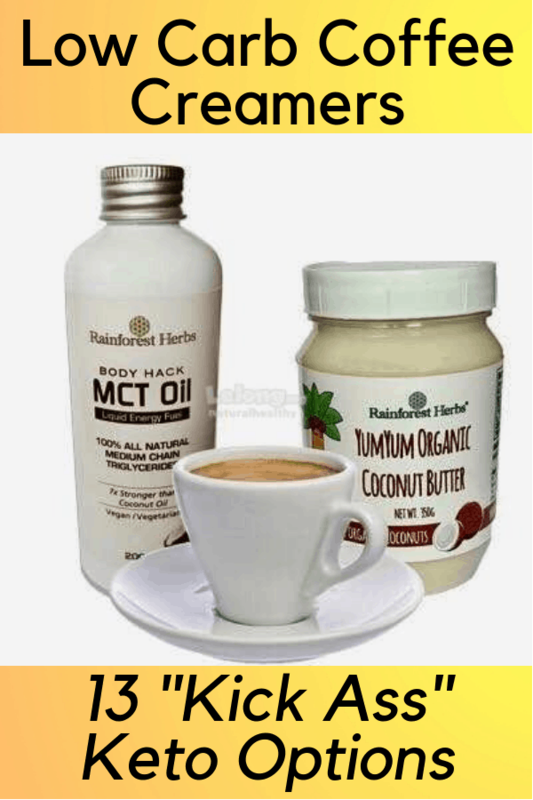 If you’re looking for a keto-friendly coffee creamer, try Keto Coffee Creamer with MCT Oil. Renew Multi Collagen Protein Powder contains collagen from all the sources you need – organic, free range bovine and chicken, wild-caught marine and eggshell membranes. How’s that for a healthy mouthful? These guys thought of everything health and beauty- wise. Seriously. This one supplement will help you look and feel young, even when you’re ageing. You’ll be able to maintain firm skin, healthy hair and nails and great digestive health. Someone call captain Jack Sparrow, I think we just find the fountain of youth! You know what’s the best part of this trustworthy source of collagen? It’s keto friendly! Like, no carbs, at all, ever. The Renew Multi Collagen Protein Powder is odorless, unflavored and dissolves easily in any liquid (think smoothie, coffee, protein shake, keto cookies, whatever). Cool, right? Renew is a trusted brand of wellness products and they take quality and client safety very seriously. This means that each batch of Multi Collagen Protein Powder is properly tested before packaging and shipment. These guys have even been endorsed by publications such as Vogue, Men’s Fitness, the New York Times and Glamour. Fancy. If you’re looking for an all-round source of Collagen Protein that fits easily into your keto lifestyle, look no further than the Renew Multi Collagen Protein Powder. This powdered wonder is everything you want from a keto-friendly coffee creamer. Peak Performance Collagen Creamer is easily mixed into hot or cold drinks and is 100% organic. Its collagen peptides are from a grass-fed source and its bamboo extract is as organic as they come. Super healthy! The low carb Peak Performance Collagen Creamer contains coconut milk, which is super creamy, so you can even skip the coffee and use this as a shake on its own. Acacia prebiotic fibres look after your gut, aiding in digestive health, even giving you additional antioxidant activity. So, what’s not in the Peak Performance Collagen Creamer? The baddies, that’s what. It contains no GMO, gluten, dairy, soy, sugar or artificial sweeteners. These guys are also philanthropists. For every container you purchase, they will donate vitamins to a child at risk of malnutrition. How’s that for some conscience with your purchase? If you’re looking for a powdered keto-friendly coffee creamer, Peak Performance Collagen Cream is the one for you. Vital Protein’s Coconut Collagen Creamer is made from organic coconut milk powder, so it’s dairy free. It’s also packed with MCT oils and lauric acid, perfect for your keto coffee. Perfect for a healthy body, the amino acids present in this Coconut Collagen Cream will improve the health of your hair, skin, nails, bones and joints. So, not only do you get a tasty morning brew, you also get to reap the benefits of coconut superfood! How’s that for two birds with one stone? It’s easy to mix into hot liquids and doesn’t have to hide in the fridge, so you can pack your Coconut Collagen Creamer when you’re out conquering the world. Vital Proteins Coconut Collagen Creamer is perfect if you’re lactose intolerant and still want an awesome cup of keto coffee. Dr Kellyann’s Slim Collagen Creamer comes in nifty single-serving packets, ideal for when you’re on the go. These little creamers can spruce up your coffee, tea or other hot drink. Sorry, this one isn’t suitable for your smoothies, guys! Vanilla flavored, it’s guaranteed to satisfy your sweet tooth without you having to ingest sugar, artificial sweeteners or other nasty chemicals. Made from only the best collagen and protein sourced straight from grass-fed cattle, monk fruit extract and coconut oil powder, Slim Collagen Creamer is said to aid in keeping your belly fat under control. What, we can have sweet and slim now? Neat! What’s more, is that this delicious wonder contains no dairy, soy, gluten or GMO. If you need help kicking the belly fat and want a nice keto-friendly creamer, Dr Kellyann’s Slim Collagen Creamer comes highly recommended. This Keto Bomb is meant to give you tons of energy that lasts forever while attacking fat and aiding your keto diet. BPI Sports Keto Bomb Creamer is available in French Vanilla Latte and Caramel Macchiato flavors. This great-tasting source of fat will add some extra kick to your morning coffee or tea, packed full of MCT oil and containing saffron extract. Saffron extract is said to curb your appetite and, according to some, also lessens fatigue during exercise. This creamer is specifically designed to enhance weight loss, so it contains absolutely no sugar. BPI Sports Keto Bomb Creamer is ideal for the fitness fanatic on a keto diet looking to shed a few pounds. This Super Creamer is a great alternative to those yucky store-bought energy drinks. Lactose, gluten and sugar free, this one is 100% organic, GMO-free and even kosher certified. Now that’s next level. You will have to store these three delicious flavors in your fridge. Original, vanilla and hazelnut and tastes absolutely fantastic and makes your favorite coffee even better. It will boost your energy for exercise and studies, round the clock while helping to maintain lean muscle and suppressing appetite. Need an organic, great tasting alternative to your normal creamer or energy drink? Try Kitu by Sunniva Super Creamer with Protein. NeuRoast Supercream is super trippy with six mushroom extracts to enhance your mental focus. This coconut milk-based keto-friendly creamer comes in basic and pumpkin spice flavors. Take that, Starbucks Pumpkin Spice Latte! Seriously, though. This is a far healthier alternative, since its organic, GMO-free and contains Lion’s Mane, Cordyceps, Chaga, Reishi, Turkey Tail and Shiitake. You can add NeuRoast Supercream to your favorite coffee or tea or chuck a bit into your morning smoothie for an added boost. Perfect for the Vegan, mindful eater, NeuRoast Supercream will add an extra boost to your meals. Need a good, keto-friendly coffee creamer on the go? The Bulletproof Coffee InstaMix Creamer is made just for you. For real. You can store a pack in your backpack, knapsack, fannypack, whatever. Made from 100% grass-fed ghee and Brain Octane fuel (like, the name says it all, right? ), there’s no shortcuts and carbs in this one. Just plain, deliciously creamy goodness for your coffee-on-the-go. It’s flavorless, to it won’t change the taste of your favorite drink, it will just make it extra creamy. Packing a true Bulletproof punch, Coffee InstaMix Creamer won’t leave you hanging in the energy department. It’s easy to use too! Grab your coffee, chuck an entire packet of InstaMix Creamer in there, shake and slurp. They say it’s more than your average MCT oil. We don’t know, but the company has a pretty good rep, so it’s probably true. Why not give it a try and let us know? No time to stop and find stacks of keto-friendly coffee creamer in your busy day? Try the Bulletproof Coffee InstaMix Creamer for an extra burst of energy when you need it most.